The man who is known in history as Slatin Pasha, Queen Victoria’s favourite, darling of the high society, with his full title General-Major Baronet Sir Rudolf Carl Baron von Slatin Pasha, G.C.V.O. (Knight Grand Cross of the Royal Victorian Order), K.C.M.G. (Knight Commander of the Order of St. Michael St. George), C.B. (Companion of the Bath), although Austrian and loyal subject of his Majesty Emperor Franz Josef I., General-Inspector of the Anglo-Egyptian Sudan for 14 years, never lost a word about his humble descent and his early years. Neither in his renowned bestseller Fire and Sword in the Sudan. A personal narrative of Fighting and Serving the Dervishes 1879—1895, (London, New York, 1895), nor in his personal correspondence he is referring to his youth and familiar background. It seems that Slatin let his life begin with his arrival in Egypt in 1873, the year his father died. But we know a little bit more about his early years and his family. The Slatin family has its origin in a little village in Bohemia, Hermanuv Mestec, which belonged to the patronage of the Kinskis, Bohemian princes since 1746. In the 18th century the Slatins were little silk merchants of Jewish origin and adopted the name Slatin, from the Czech root zlato/zlaty, which means gold/golden. When moving house to Vienna at about 1820, they soon became Roman Catholic (1838) to have better chances in social life and owner of a house in Ober-St.-Veit in the vicinity of Schönbrunn Castle. Rudolf Slatin was the 4th child out of 6, born on June 7th, 1857. There is nothing special to say about his school time, except that he was brilliant in mathematics but not in languages. At the age of 16 he left school abruptly, following an advertisement of a bookseller in Cairo who was looking for an assistant. But a few weeks later he abandoned the job and joined a group of adventurers, belonging to different nationalities, travelling as far as to the Nuba Mountains in Kordofan. In Khartum he met Dr. Eduard Schnitzer, a Jewish physician and botanist of reputation, who, after his conversion to Islam became Emin Pasha, the later governor of Equatoria Province, famous for his relief by Henry Morton Stanley in 1889. Slatin liked the idea to accompany Schnitzer to Charles Gordon, then governor of Equatoria, but he had to follow the call for service in the Austrian-Hungarian army and he was recruited in 1876. In July 1878 — meanwhile he was lieutenant — Gordon invited him to come to Egypt and join his staff and Slatin dismissed the Austrian army and in 1879, when he reached Khartum, Gordon appointed him Financial Inspector for the Southern District of the Sudan. But Slatin did not like this office, because he saw that it was nearly impossible to struggle against corruption everywhere and the bitter poverty of the population because of very high and unjust taxes. So Gordon made him Mudir — District Governor — of Dara in Darfur Province by cable. Slatin had to fight against the son of the former sultan of Darfur, who tried to reconquer Darfur, but was totally defeated by Slatin’s strategic genius, although the sultan had far more troops than Slatin. At the end of the year 1880 the governor of Darfur — a wealthy but corrupt Sudanese merchant — had to quit service and Slatin became governor with the title of Bey. But in 1881 the Mahdiyya began, dreadful 18 years of fighting and oppression in the Sudan’s history. The Mahdists endangered Shakka, the capital of the Southern region of Darfur, so Slatin had to increase his army and in October 1881 he marched from Dara to Shakka, but was defeated at Om Waragat, some miles northern of Shakka. "Since my appointment as Governor of Darfur, I have been engaged in warfare, I was left in Darfur without officers; some of them had been dismissed by the Government, and the few remaining ones were not fit to take command. After several battles, all more or less unsuccessful, the Arabian officers who bore me a grudge gave out among the soldiers as their opinion that the cause of my defeat lay in my being a Christian. In order to stifle these injurious opinions, I gave out that I had for some years already practised the Mahomedan religion and now publicly proclaimed my conversion. By this step I had regained the confidence of my soldiers, inspired them with hope, had given them a happy confidence, uprooted malicious intrigues and conducted several successful battles until the annihilation of the army in Kordofan commanded by Hicks. Whether by my conversion I committed a dishonourable step is a matter of opinion-it was more easy to me because I had, perhaps unhappily, not received a strict religious education at home. I commanded in Dara against the Razagat but the demoralised troops refused to fight any longer. Officers and men demanded capitulation, and I, standing there alone and a European, was compelled to follow the majority and compelled to capitulate. Does your Excellency believe that to me, as an Austrian officer, the surrender was easy? It was one of the hardest days of my life. By submission and obedient behaviour I have attained a certain degree of confidence among the local magnates, and have thus received permission to write to you, because they are of opinion that by these lines I am requesting Your Excellency to surrender" (General Gordon’s journal: 453f). "He evidently is not a Spartan, he also says that he changed his religion because he had not had much attention paid to his religious belief when young. If he gets away I shall take him to the Congo with me, he will want some quarantine; one feels sorry for him." (General Gordon’s journal: 200). Within a short time Slatin has fought 27 times against the enemy and has been beaten only twice. After his surrender Slatin soon was transferred from Dara to el-Obeid, where the Mahdists had their camp to become a captive for 12 years. Slatin had to give the Mahdi his oath of allegiance and became one of his courtiers. The Mahdi kept a tight reign now on Dara, El Fasher, El Obeid Bahr el Ghazal, where non-believers were mercilessly flogged and tortured to expose their hidden treasures. Charles George Gordon, nicknamed Chinese Gordon, because he was present at the occupation of Peking in October 1860 and personally directed the burning of the Chinese emperor’s summer palace, was born on January 28th, 1833 and died on January 26th, 1885. He became a national hero for his exploits in China and his ill-fated defence of Khartoum against Sudanese rebels. In 1873 the khedive Ismail Pasha (1830—1895) of Egypt, who regularly employed Europeans, appointed Gordon governor of the province of Equatoria in the Sudan, where he — between April 1874 to December 1876 — mapped the upper Nile River and established a line of stations along the river as far south as present Uganda. In 1877 Ismail appointed Gordon governor-general of the Sudan and he began to lead a crusade against the slave trade and, to assist him in this humanitarian enterprise, he surrounded himself with a cadre of European and American Christian officials. In 1877 Ismail had signed the Anglo-Egyptian Slave Trade Convention, which provided for the termination of the sale and purchase of slaves in the Sudan by 1880. Gordon set out to fulfil the terms of this treaty and in whirlwind tours through the country he broke up the markets and imprisoned the traders. Gordon’s crusading zeal blinded him to his invidious position as a Christian in a Muslim land and obscured from him the social and economic effects of arbitrary repression. Not only did his campaign create a crisis in the Sudan’s economy but the Sudanese soon came to believe that the crusade, led by European Christians, violated the principles and traditions of Islam. By 1879 a strong current of reactions against Gordon’s reforms was running through the country. People connected the economic depression with Gordon’s Christianity and then, in the middle of rising discontent in the Sudan, Ismails financial position collapsed, the European powers had to oversee Egyptian finances. After 16 years of glorious spending, Ismail sailed away into exile and Gordon resigned but left a perilous situation in the Sudan. Many of the ablest officials, both European and Egyptian, had been dismissed by him, departed with him, or died in his service. Castigated and ignored by Gordon, the bureaucracy had lapsed into apathy. Such was the Sudan in June of 1881 when Muhammad Ahmad declared himself the Mahdi. The Mahdi, his original name was Muhammad Ahmad Ibn as-Sayyid Abd Allah (August 12th 1844—June 22nd 1885) was the son of a Nubian boat builder who claimed descent from the prophet Muhammad. Deeply religious from his youth, he was educated in one of the Sufi orders, the Sammaniyah, but he later secluded himself on Aba Island in the White Nile to practise religious asceticism. In 1880 he toured Kordofan, where he learnt of the discontent of the people and observed those actions of the government that he could not reconcile with his religious beliefs. Upon his return to Aba Island he clearly viewed himself as a Mujjadid, a renewer of the Muslim faith, his mission to reform Islam and return it to the pristine form practiced by the Prophet. To the Mahdi — the word means the right or divinely guided one, a title which does not appear in the Quran but was traditionally used by Islamic religious reformers, the orthodox Ulama who supported the administration were no less infidels than Christians, and, when the later lashed out against misgovernment, he was referring as much to the theological heresy as to secular maladministration. By the Sudanese he was regarded as an eschatological figure, one who foreshadows the end of darkness and heralds the beginnings of a new era of light and righteousness. People thought that he would fill the Earth with justice and equity and found a 1000-year lasting religious empire. Muhammad Ahmed was a tall, broad-shouldered man of light brown colour, and powerfully built; he had a large head and sparkling black eyes; he wore a black beard, his nose and mouth were well shaped, and he had the habit of always smiling, showing his white teeth and exposing the V-shaped aperture between the two front ones, which is always considered a sign of good luck in the Sudan, and is known as falja, so many women called him Abu falja. He wore a short quilted jibba, beautifully washed, and perfumed with sandalwood, musk and attar of roses; this perfume was celebrated amongst his disciples as Rihet el Mahdi — the odour of the Mahdi — and was supposed to equal, if not surpass, that of the dwellers in Paradise. Now, what was the nature of his teachings? He had preached renunciation, he strongly had opposed against earthly vanities and pleasures; he had broken down both social and official ranks; he had made rich and poor alike; he had selected as clothing the jibba, which became the universal dress of his adherents. As a regenerator of religion, he had united the four distinct Moslem sects, which differ from each other only in minor details and he had made a collection of certain specially selected verses from the Quran which he called Rateb, and which he enjoined should be recited by the entire congregation after morning and afternoon prayers — a ceremony which lasted at least forty minutes. He had forbidden dancing and playing, and those found disobeying this order were punished by flogging and confiscation of all property. The use of bad language was punished with 80 lashes for every insulting word used and seven days imprisonment. The use of intoxicating drinks, as date wine or other alcoholic beverages and smoking were strictly prohibited. A thief suffered the severance of his right hand, and should he be convicted of a second offence, he lost his left foot also. He ordered that henceforth all heads should be shaved. "Fearful that his doctrines which were considered unorthodox, should be made known in the various foreign countries by which he was surrounded, he practically made a cordon round the countries he had already conquered, and absolutely prohibited passage of persons through these districts for the purpose of performing pilgrimage to Mecca. As however, most of the dispositions and ordinances were entirely at variance with the Muslim law, he therefore issued, that the study of theology and all public commentaries thereon should cease and ordered that any books or manuscripts dealing with these subjects should be instantly burnt or thrown into the river" (Slatin 1897: 232f). "Openly he showed himself a most strict observer of his own teachings; but within their houses, he, his Khalifas, and their relatives, entered into the wildest excesses drunkenness, riotous living, and debauchery of every sort, and they satisfied to their fullest extent he vicious passions which are so prevalent amongst the Sudanese" (Slatin 1897: 232). The Mahdi converted the diversified discontent of the people into a unified movement and into an unconquerable military machine of the faithful ones and within less than four years al-Mahdi, who set out from Aba Island with a few followers armed with sticks and spears, ended by making himself master of almost all the territory formerly occupied by the Egyptian government, capturing an enormous booty of money, jewels, and military supplies — including Krupp artillery and Remington rifles (EB Macropedia 23: 697). Al-Mahdi’s pious Ansar — that means helpers or followers — were sure that in his person he conformed to all that was traditionally expected of a Mahdi. Understandably, European captives drew a less-favourable picture. But let us come back to what was going on in Khartum. Since January 1884 Gordon was in Khartum and in August the Mahdi concentrated his army there and gave order to Slatin to write a letter to Gordon to surrender. But Slatin, on the contrary, wrote 3 letters to Gordon and the Austrian consul Martin Ludwig Hansal (1823—1885), imploring them to make possible a flight for him and never to capitulate. But the Mahdi realized Slatin’s double game and he was accused to be a traitor and put in chains. "It was scarcely light, and I could barely distinguish objects. Could this possibly be the great attack on Khartum? A wild discharge of firearms and cannon, and in a few minutes complete stillness? The sun was now rising red over the horizon; what would this day bring forth? [...] Soon shouts of rejoicing and victory were heard in the distance, and my guards ran off to find out the news. In a few minutes they were back again, excitingly relating how Khartum had been taken by storm, and was now in the hands of the Mahdists. A great crowd had collected before the quarters of the Mahdi and Khalifa, which were not far off; then there was a movement in the direction of my tent, and I could see plainly they were coming towards me. In front marched three Black soldiers; one named Shatta carried in his hands a bloody cloth in which something was wrapped up, and behind him followed a crowd of people weeping. The slaves had now approached my tent and stood before me with insulting gestures: Shatta undid the cloth and showed me the head of General Gordon! The blood rushed to my head, and my heart seemed to stop beating; but with a tremendous effort of self-control I gazed silently at this ghastly spectacle. His blue eyes were half-opened: the mouth was perfectly natural: the hair of his head and his short whiskers were almost quite white. ‘Is not this the head of your uncle, the unbeliever?’ said Shatta, holding the head up before me. ‘What of it?’ I said quietly. ‘A brave soldier, who fell at his post. Happy is he to have fallen: his sufferings are over’" (Slatin 1897: 206). Very soon after the fall of Khartum, on June 28th 1885, the Mahdi died suddenly, some say by typhoid fever, some because of his sybaritic lifestyle and sexual perversions. "[...] the Khalifa knew that I was the only remaining High Egyptian official and it flattered his vanity to have practically as his slave the man who had formerly governed the whole of the great province of Darfur, including his own country and tribe the Baggara. He frequently said: ‘See, this is the man who was formerly our master. Now he is my servant, and must obey my commands at all times’" (Slatin: 1897: 357f). The Kalifa was a very suspicious man, always fearing upheavals and plots which he sanctioned with horrible slaughters, letting whip his enemies to death, letting cut off their limbs and some cruelties more. In 1891, during a rebellion of the Mahdi’s relatives and the following confusion, the Austrian missionary Father Joseph Ohrwalder escaped with 3 nuns and told the international press what was going on in Omdurman under the Khalifa’s cruel regime, so that people in Europe became more and more interested about the political situation and England — though reluctantly — made sure for a revenge to come. "With the exception of the few broad roads which the Khalifa has made for his own convenience, the only communications between the various quarters consist of numbers of narrow winding lanes, and in these all the filth of the city is collected. Dead horses, camels, donkeys, and goats block the way, and the foulest refuse lies scattered about. Fever and dysentery are the prevailing maladies in Omdurman, and between the months of November and March an almost continuous epidemic of typhus fever rages" (Slatin 1897: 352). No wonder that Slatin from the earliest days of his captivity thought about flight though he did not dream that twelve long years of misery, and humiliation had to elapse before an escape was possible. The incessant efforts of the Austrian consul in Cairo, Baron Heidler von Egeregg and Major Wingate, chief of the British Intelligence Service in Cairo and later Slatin’s best and true friend, made it possible to arrange Slatin’s flight on February 20th, 1895 across the desert which lasted 3 weeks until March 16th 1895, when at last he reached Aswan having walked behind his tired camel the last four days barefooted over stones because he had lost his sandals. From Aswan he went to Cairo by train where he arrived in the morning of March 19th. He was welcomed warmly by diplomats and friends and the Times-correspondent also was present and a photographer took snap-shots. The Khedive Abbas II. Hilmi conferred upon him the title of Pasha, he was promoted to the rank of colonel, and posted to the Egyptian Intelligence Department. Soon after his escape Slatin began to write his book Feuer und Schwert im Sudan, the English version with the assistance of Colonel Sir Reginald Wingate. Very soon he followed an invitation of Queen Victoria to London where he was bestowed with the Order of Commander of the Bath and knighted. Between 1895 and 1900 Slatin very often was a special and warmly welcomed guest of Queen Victoria at Balmoral and other palaces. The Queen liked Slatin’s courtly manners as well as to have her most interesting conversations with him in her beloved German and she could not get enough informations and thrilling tales from this vivid man. In 1896 Slatin went back to Egypt to help the English with his special knowledge about the Sudan to reconquer it, which happened on September 2nd, 1898 at Omdurman by General Horatio Kitchener. The Khalifa was killed in the final Battle of Umm Dibavkarat on November 24th, 1899. Slatin became Major-General of the Egyptian army, the highest rank which was ever given to a non-English foreigner. In 1899 Slatin again travelled to Kordofan, accompanying some geologists, who hoped to find gold in the mountains but they had to return disappointed. 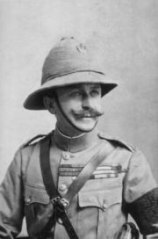 Slatin became General-Inspector of the Sudan in 1900 and held this position until 1914 when World War I broke out and Austria and England suddenly became enemies. He returned to Austria and married Alice von Ramberg, with whom he had a daughter, born 1916, who later became a member of the English High Society. In September 1915 he became deputy director of the Central Information Bureau for Prisoners of War and Red Cross Vice-President for Prisoners of War. During the War he tried to use his old connections with England for a separate peace which did not make him friends here and there. In 1918 the war was over and Slatin’s monarchistic world was destroyed but in spite of that he followed an invitation of the Austrian Government to use his English connections to urge the Czech Government to send food and coal to the needy Austrian population and really the Czech Government helped Austrians to survive those dreadful early post-war times. In 1919 Slatin was sent to the St. Germain peace negotiations concerning the return of war prisoners to Austria which task was very troublesome. In 1920 he retired to live in Montreux, Switzerland, but after his wife’s untimely death in June 1921 he bought a house near Meran, Italy. He died in a Viennese hospital, having suffered of cancer, in October 1932. He was buried in Vienna at Ober-St.-Veit cemetery.